John commented on receiving his trophy "I had an emotional reaction to receiving Denver's Cup. For some reason he repeatedly use to say that he wanted me to win his trophy" (Denver passed away in 2006). Gregg reflected "I was honored to accept the Glanville trophy". The MGTD that Jeff raced was the former Bob Colaizzi MG that won the first Vintage Collier Cup in 1985. And Joe Tierno's MGA is the same MGA that Bob Bucher won the 1957 Collier Cup with 50 years ago! It just keeps getting better and better! 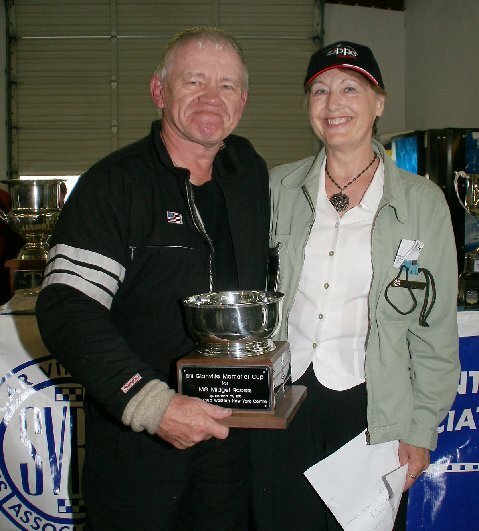 Photo below is of Gregg Kuzuhowski with the Bill Glanville Memorial Cup, ,with Suzanne Glanville, widow of Bill Glanville, next to him. Photo may be used with article as long as photo credit is given: "Pietrowicz Photo".